Friendly reminder: These are not all of the MEMAP related posters and slide shows in existence; a complete list is provided in the Project Output page bibliography. This page only lists those posters and presentations that have been uploaded for anyone to access. For copies of other posters or presentations please contact us through the form on the Project Output page. Davis, J., A. Zipkin, V. de Moor, J. C. Thompson, J. R. Arrowsmith, M. B. Foster and E. Gomani-Chindebvu (2015). “Exploratory survey and landscape archaeology in the Karonga District, northern Malawi”. Poster presented at the Paleoanthropology Society conference in San Francisco, California. Schilt, F., S. Mentzer, D. Wright, J. Thompson, C. E. Miller and E. Gomani-Chindebvu (2015). ‘Micromorphology of Middle to Later Stone age sites in northern Malawi”. Poster presented at the Paleoanthropology Society conference in San Francisco, California. Thompson, J.C., Zipkin, A., Nightingale, S., Wright, D.K., Choi, J-H., Mackay, A., Welling, M., Schilt, F., and Gomani-Chindebvu (2013). “New Discoveries of Old Sites: The Legacy of J.D. Clark in Karonga, Malawi”. Poster presented at the Paleoanthropology Society conference, Honolulu, Hawaii, USA. Abstract: PaleoAnthropology 2013: A36. Zipkin, A.M., Hanchar, J.M., Thompson, J.C., Brooks, A.S., Toth, N.P., Schick, K.D., Gomani-Chindebvu, E. (2013). “The trace element geochemistry of archaeological ochres from Chaminade Hill, Karonga, Malawi”. Paper presented at the 4th conference of the East African Association for Paleoanthropology and Paleontology (EAAPP), Mombasa, Kenya. Zipkin, A., Brooks, A.S., Hanchar, J.M., Thompson, J.C., and Gomani-Chindebvu, E. (2012). “On the formation and distribution of ochre in northern Malawi”. 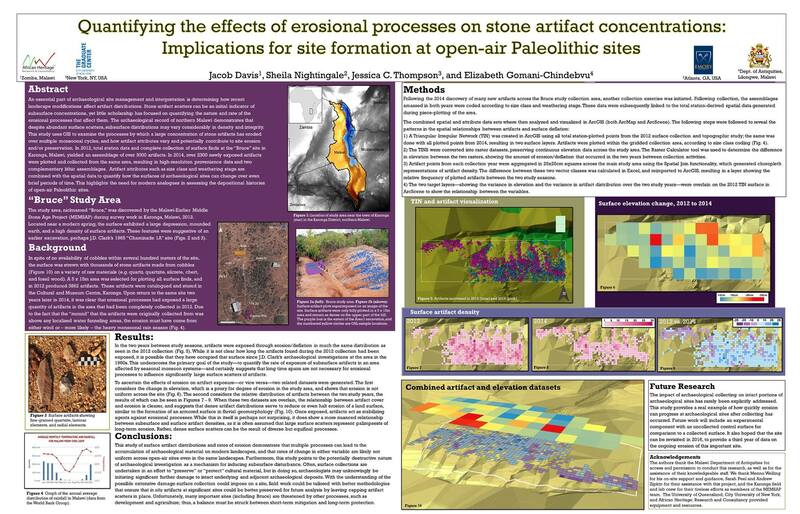 Poster presented at the 77th annual Society for American Archaeology conference, Memphis, Tennessee, USA. Thompson, J.C., Welling, M., Pargeter, J., and Wright, D.K. (2010). “The Malawi Earlier-Middle Stone Age Project: Preliminary Results from 2009 Fieldwork”. Poster presented at the Paleoanthropology Society conference, St. Louis, Missouri. Abstract: PaleoAnthropology 2010: A34.